Short list again this week – but I think you should see my Saturday list! Friday is tax day in SW Harbor, so I will meet my tax buddy at the LL Bean parking lot in Ellsworth at 8, and we will drive down to the Island, do taxes all day, and he will drop me back there around 5. I might get Finelli’s pizza on my way home (yum! ), then I will crash on the couch with my knitting. Saturday, we are having breakfast in a new little place A found in Brewer. Then we will head off to Bangor to the bead store, where I will get some more supplies for knitted necklaces, and sign up for TWO classes – only $120 each, plus supplies. They will be on 2 Saturdays in March. I am excited as I have wanted to take classes there for a while, but it never worked that I found out about them in time. Ahh, good food and crafting. And then, of course, all the chores I won’t be doing on Friday – groceries, laundry, PO. 🙂 Life is good. And Sunday, perhaps I will get up to start cleaning the craft room a bit more. Tiny steps. So I just want to say that the other morning, I heard Todd Simcox, channel 5 (WABI TV 5) use proper English in a place where normally people don’t. Not local yarn, not using an adjective incorrectly as an adverb, but making an adverb out of an adjective with the simple addition of -ly. Todd, I am so proud of you. I hope you dress warmly and drive safely. I hope you continue to be an example for news people in Bangor and across the country, showing that it is possible to deliver the news and weather and use proper grammar at the same time. Now, if you could please deliver an early spring, I would be very appreciative. Thanks so much, cedwards83 at purlsjustwannahavefun for nominating me for a liebster award. I am honored that you chose me and my funny little blog. *Thank the person who has nominated you and link back to their blog (by posting a link on yours). *Copy and display the award in your blog post (save the pink image above and upload it to your own post). *Answer the 11 questions about yourself, which are given to you by the person who nominated you. *Write 11 random facts about yourself. *Nominate 5 – 11 blogs/bloggers that you feel deserve the award. They need to have less than 1000 followers. *Think of 11 new questions for the bloggers you have nominated and write them in your post. *Inform the selected bloggers that they have been nominated for the Liebster award and link back to your own post so that they can learn about it (if they don’t already about it) and so that they know what questions to answer. Can’t drink it anymore, but it used to be Coke. Now my favorite cold beverage is lemonade. 3.Which do you like better cats or dogs? I love them both, but have cats because we work so much. I would love to have a lab or shepherd puppy when we retire, though. 4.What is your favorite color? 5.What is your favorite food? Interesting. I love food. Not sure i can name a favorite food, but I can say that my favorite MEAl is rare Roast beef, mashed potatoes, green beans. mmmmm. Mom makes it every year for Christmas, how lucky am I? 6.What chore do you hate? Vacuuming. As in detest. As in have no rugs so I never have to do it. I would sweep every day if it meant never vacuuming again. Thankfully for me, A is willing to do it if I keep the bathrooms clean. DEAL! 7.Do you prefer indoors or outdoors? Usually, outdoors, but not in any weather, only on nice days. 8.Which do you like better pool or ocean? Ocean. But pool is much better than nothing. LOVE water and swimming. 9.What is your favorite time of day? 10.If you could have lunch with anyone, living or dead, who would it be? My grandparents. I have so many questions, so many stories I vaguely remember and I just miss them all. 11.If you could live anywhere in the world where would it be? 1 Which do you prefer – read the book or see the movie? 2 What would you tell your 16-year-old self to make his/her life more meaningful? 3 What is your favorite thing to do on a rainy day? 4 If you could give a million dollars away, who would get it and why? 5 Would you rather live in the city or country? 8 Your favorite TV show? 9 What is your favorite outdoor activity? 10 What is your pet peeve? 11 What one thing do you wish you could do better than you do? The view from the couch – not that I spent a lot of time on the couch this weekend – yea! When I cleaned out the bird feeder the other day, I dumped the old seed out on the railing, thinking the mourning doves would like that. Don’t know if they do or not, but this fellow joined the chickadees. 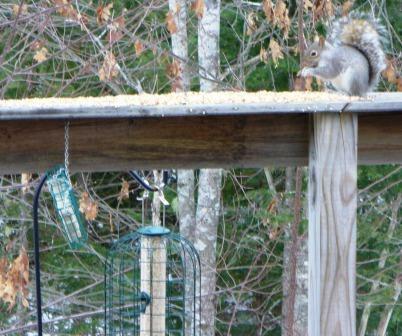 He spent some time trying to break into the suet and the feeder (unsuccessfully), but finally went with the low hanging fruit. Meanwhile, Zumba kept a close watch on him. Not sure what she would have done if I let her out, but I suspect he would have survived. … Yesterday was planned to be a typical Saturday with some chores, some crafts, some Olympics. But a call in the morning from our dear friend B (aka Crimson Crow) changed that, and we met her for a late breakfast at the Riverside Cafe in Ellsworth, then she came over for a visit, to see what’s new here and play some games. It is always good to see her. And as she follows this blog, she and A were teasing me about it, and why I think anyone cares what I do each day. I am not sure why you all do, but I am glad you do! But as promised, B, you are featured here again. And you didn’t even have to rescue me from a dead snake. The light still wasn’t great Friday, but it was on my list, so I took some photos. Zumba helped, as you can see. 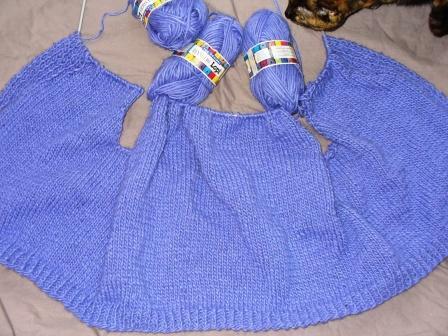 Here is the vest in progress, and the completed pair 3 of Socks with Sarah. Pair number 4 is in progress, but I frogged what I did last week, and redid it in a smaller size. The yarn, Cascade Heritage, was a lot looser than the Tosh Sock. I am quite happy with the new size now, and have made good progress, just turned the first sock heel. Only 48 stitches in a row – they fly! I also am thinking about a few more of the collage pieces like I did this summer with niece C. I like how mine came out, and I wonder if they would make nice gifts? I need a housewarming gift for my brother this spring, and so am toying with what that would look like. Also, spring birthday season is nearly upon us, so I need to make a pile of birthday cards. Last chore up there was to start the clearing/cleaning/organizing. I made a tiny bit of progress today – got the last of the Christmas card rubble cleaned up. 🙂 I know it will be slow progress, because it is overwhelming, and I don’t have systems in place for everything, which is why it looks like it does. I need to really see what is there and create the organizational systems to deal with it. But as I clean, I get distracted, because I find things I want to work on. Good morning! Thanks to the weather, my list today is back to normal! I was supposed to be doing taxes in Milbridge (an hour away) but yesterday, my volunteer and I decided with the forecast for some of everything but sun, we would postpone to the 7th. Exactly what the doctor ordered. 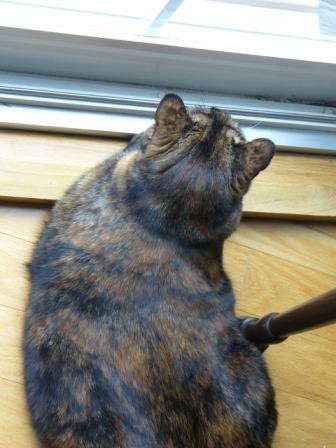 Other than that, I have to take Tigger to the vet to get her staples out, go to the PO for the mail, clean the pellet stove, knit on my KAL socks, do some laundry and putter around the house picking up. I might fit a nap in there somewhere, too. I feel a lot better this morning, but not 100% yet. 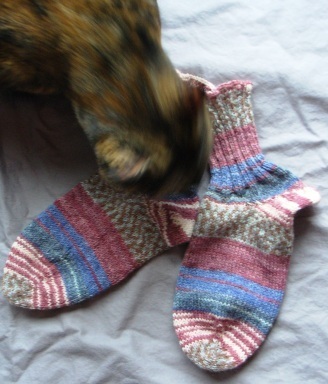 I also want to try to get some decent photos of the third pair of socks complete, and the fourth pair on the needles. Trying to do a better job of that for here and also to keep Ravelry more up to date. only half a day on the couch – progress! Anyway, once home, snuggled back under the big blue striped blanket and snoozed, and did my KAL knitting – finished the third pair of socks. I’ll take photos in the next few days, when the light is good (May? June?). I’ll cast on the next pair before I head off to bed so I have them ready to take to work with me tomorrow. Yes, I will try again. I think if I pay more attention to such things as lunch and meds, I will make it just fine. 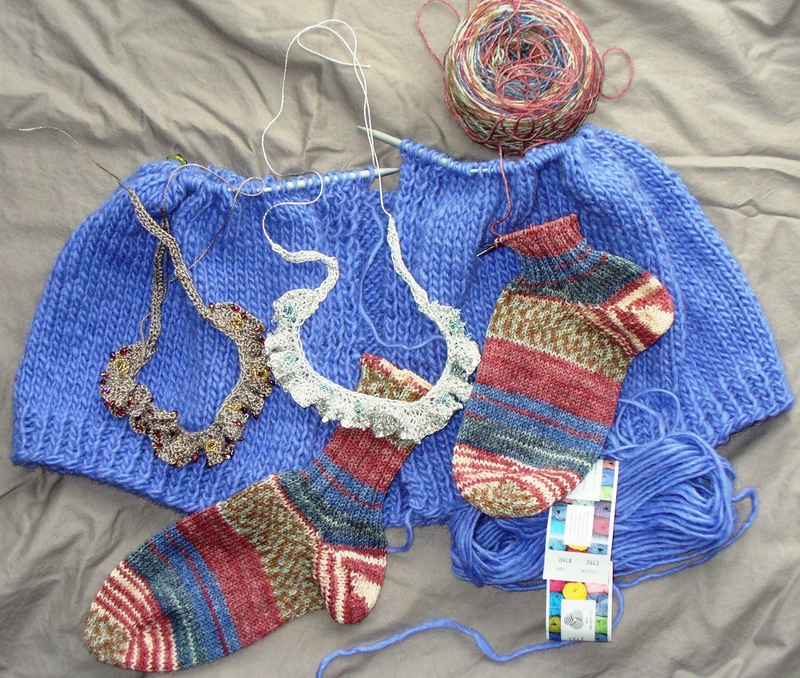 Author salpal1Posted on February 19, 2014 Categories how I spent my day, how it came out, what I am makingTags knit, long week at work, off the needles, socks with Sarah, WIP5 Comments on only half a day on the couch – progress! and I think it will be the last. Not only because I am feeling a bit better, but because I am getting a case of cabin fever. I have watched about thirty hours of Olympics and knit hundreds of yards…. and slept many hours. This bug is a tough one – all weekend, the 4 hour meds lasted about three hours, so I felt a bit better for about 2… then it went down hill until I could take another dose, then wait an hour for it to kick in. That’s how I can tell I am getting better – the four-hour meds are lasting just about four hours. By tomorrow, I hope I can go longer between doses. Oh, and guess what? Yep, more snow coming today and tonight. But only 3 inches or so. Just enough to require still more shoveling and plowing. Ugh. 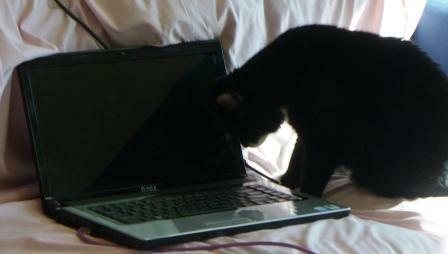 Here’s a cute photo to finish with – Allie Cat loves to chase the computer cursor. She was thrilled to find the computer on the couch this weekend. But where is the cursor?